Our range of products include maxbond sbr 031, max membrane, max proof iwc and max ar 40 acrylic polymer emulsion. MAXBOND SBR 031 is a carboxylated styrene butadiene copolymer latex admixture that is designed as an integral adhesive for cement bond coats, mortars and concrete to improve bond strength, durability, chemical resistance and reduce permeability. It is used for modifying and improving bonding of floor toppings, renderings and mortars; repair of worn, damaged concrete, repair of large cracks; polymer modified floor screeds; waterproof plasters for masonary & coatings. Reduces cracking through increased mortar flexural strength. Improves bond strengths to hardened concrete. Pour 2 liter of MAX AR - 40 with 4 liter of clean water into a clean container. 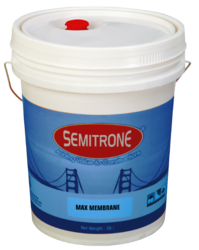 Add the “SEMITRONE” brand Tiles Adhesives, Glass Mosaic Adhesives powder slowly continuously mixing until a smooth toothpaste consistency is achieved. Allow to stand for 3-5 minutes. Re-stir. The product is now ready to use. You can also use MAX AR - 40 as a total water replacement in the Tiles Adhesives, Glass Mosaic Adhesives. · It has excellent anti – carbonation property. · Easy , simple and quick application. · Very light in weight – no more load on structure. · High flexibility resist against micro movement of structure during temperature up down. We t the surface with sprinkling water. Add water in MEMBRANE in 1:05 ratio (max membrane :Water) and mix thoroughly apply as as a primer coat on entire area. Water tanks, Dams, Cannels etc. MAX AR - 40 is an acrylic polymer emulsion that has been specifically formulated for the addition to” “SEMITRONE” brand Tiles Adhesives, Glass Mosaic Adhesives & MAX JOINT FILLER (GROUT). This admixture will significantly improve the bond strength; provide higher density resistance to thermal shock and flexibility of adhesives & grouts. Because of its acrylic base, this liquid can enhance a grout’s appearance through better colour retention and less fading caused by ultraviolet rays. · Increases durability & high bonding. · It is excellent for grouting tiles with high absorptive levels about 7 % or better. · Increases weather resistance of grout. Looking for WATER PROFFING SYSTEM ?